Lower back pain can be debilitating, one that many people experience every day, for a variety of reasons, ranging from injuries to medical conditions. Whether you have suffered an injury or experience chronic back pain, you undoubtedly know how aggravating it can be. In extreme cases, it can make ordinary, daily tasks seem difficult to do. Our warm moist heating pads can help relieve lower back pain fast and naturally, the heat penetrates the muscle tissue, allowing them to relax and relieve pain. All our heat packs can be used either warm or cold depending on the therapy you require. Whether you are a weekend warrior, sports athlete, gardener, or someone who suffers from lower back pain, one of these natural heat packs should work for you and your back. Heat therapy is far better for lower back pain than cold therapy, since the majority of lower back pain is caused by muscle knots or similar problem. Cold therapy should only be used for an injury caused by inflammation. Lower back pain is brought on as a result of muscle strain or over-exertion from exercising or some other type of physical activity. When the soft tissues and muscles around the lower part of the spine experience tension, proper circulation is restricted. The brain receives pain signals from that area of the body. The warm temperature helps to increase blood supply to the affected area by dilating blood vessels of muscles around the lumbar spine. With the increased blood supply, more nutrients and oxygen are delivered to the muscles to heal tissue that has been damaged through overexertion. Heat therapy can also stimulate the elimination of toxins. Sports Therapy Wrap: The heat wrap/heat pack used by therapists. This is a great gift for everybody. Extra large size, weight and penetrating moist heat provides comfort for those who suffer with lower back pain. Infused with our signature anti-stress aromatherapy blend of lavender, peppermint, eucalyptus, rosemary and cloves. Comes with an adjustable belt to hold the wrap firmly in place. Extra long heat holding – 1 hour or longer. Contains our anti-stress blend. Use warm or cold to assist with the relief of aches, pains and stress. The perfect stress relieving gift. (10″ X 26″). 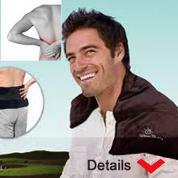 The cover comes in black velvet with an embroidered Warm Buddy logo.Our most popular heat pack are used for fast lower back pain relief. Our Body wrap is also a time tested warrior against lower back muscle pain and stress, slightly smaller (9" x 19") than the Sports Therapy wrap, but carries an equal pain relieving punch, it contains lavender which helps to relieve pain and stress, it also has a removable cover and an assortment of fabric covers. The Body Wrap can also be used hot or cold depending on what therapy is required. Recent studies have found that heat wrap therapy proved to be more effective at treating lower back pain than oral pain medications such as ibuprofen and acetaminophen. Warm Buddy heat wraps are proudly made in Canada. Our Body Wrap offers the perfect combination of using it hot or cold to relieve muscle and back pain fast and naturally. Visit our online store for a quick and easy way to purchase other Warm Buddy pain relief products. For both these therapies it is always handy to have 2 heat packs available for immediate applications , one for warmth and the other to keep in the freezer for cold therapy applications.. Many episodes of lower back muscle strain result from strains and over-exertions, creating tension in the muscles and soft tissues around the lower spine. As a result, this restricts proper circulation and sends pain signals to the brain. Muscle spasm in the lower back can create sensations that may range from mild discomfort to excruciating lower back pain. Heat therapy can help relieve pain from the muscle spasm and related tightness and lower back pain relief. Using one of our heat packs will help you relieve lower back pain and muscle tension. Heat therapy dilates the blood vessels of the muscles surrounding the lumbar spine. This process increases the flow of oxygen and nutrients to the muscles, helping to heal the damaged tissue. Heat stimulates the sensory receptors in the skin, which means that applying heat to the lower back will decrease transmissions of pain signals to the brain and partially relieve the discomfort. Heat application facilitates stretching the soft tissues around the spine, including muscles, connective tissue, and adhesion's. Consequently, with heat therapy, there will be a decrease in stiffness as well as injury, with an increase in flexibility and overall feeling of comfort. Flexibility is very important for a healthy back. Cold therapy is most effective if it is applied as soon as possible after the injury occurs, usually within 24 to 48 hours. The cold makes the veins in the tissues contract, reducing circulation. Once the cold is removed, the veins overcompensate and dilate and blood rushes into the area. The infusion of blood in the area brings with it the necessary nutrients to help the injured back muscles, ligaments and tendons to heal.